Printing transistors is nothing new – silicon fabrication is, after all, essentially a print process – but printing silicon ink onto flexible substrates is usually a problem because there's too much heat for the medium to handle. The difficult step is annealing, as that process turns a silicon ink into the polysilicon that forms the transistor. Pulling off that trick needs temperatures of around 350°, too much heat for substrates. So Delft University of Technology boffins have skipped the annealing step, instead firing a laser at the target for a few nanoseconds. The process, which their research says is suitable for plastics like PET, polyethylene naphthalate, as well as ordinary paper, is also dead simple. As the canned release quotes Delft professor Ryoichi Ishihara notes, you just scrape the silicon ink on the substrate and fire the laser. “We coated liquid polysilane directly on paper by doctor-blading, or skimming it by a blade directly in an oxygen-free environment. Then we annealed the layer with an excimer-laser”, he says. The research paper states: “Using this method, poly-Si transistors were created at a maximum temperature of only 150°C” – which, since it only lasts a few nanoseconds, leaves the substrate completely intact. Even excimer-lasers are perfectly non-exotic, since they're used to manufacture smartphone displays. They reckon performance is just fine as well: “thin-film transistors using the laser-printed layer exhibited mobilities as high as those of conventional poly-silicon conductors”, the release notes. 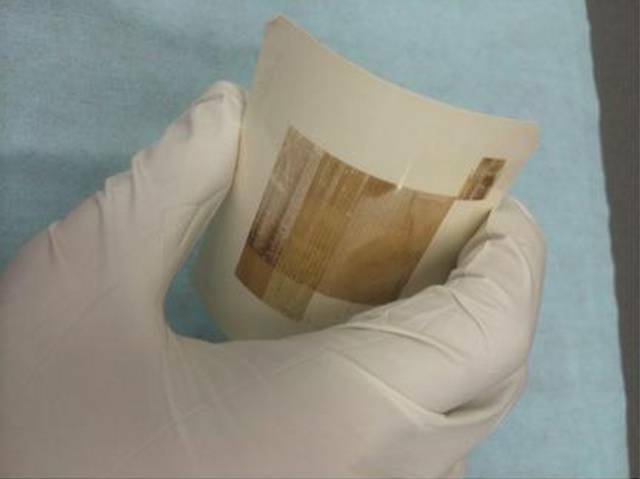 The process would be useful in the flexible/wearable electronics market now, the group says, and if other non-silicon layers can be added to fabrication, it could also be applied to solar cells and biomedical sensors.